Oh, Sarabeth’s. I’ve wanted to go to you for so long. And I finally did. And I have to say, I have mixed feelings. When my lady dining partner and I entered Sarabeth’s, we were both struck by the sophisticated atmosphere that the Park Avenue South location exudes: wide open windows, lots of natural day light, an open floor plan with seating in the rear. Because we didn’t have a reservation (for lunch! ), we had to sit at the marble countertop bar, which was fine. We parked in a corner spot and chatted for a while, and an accommodating bartender asked us for our drink orders immediately. 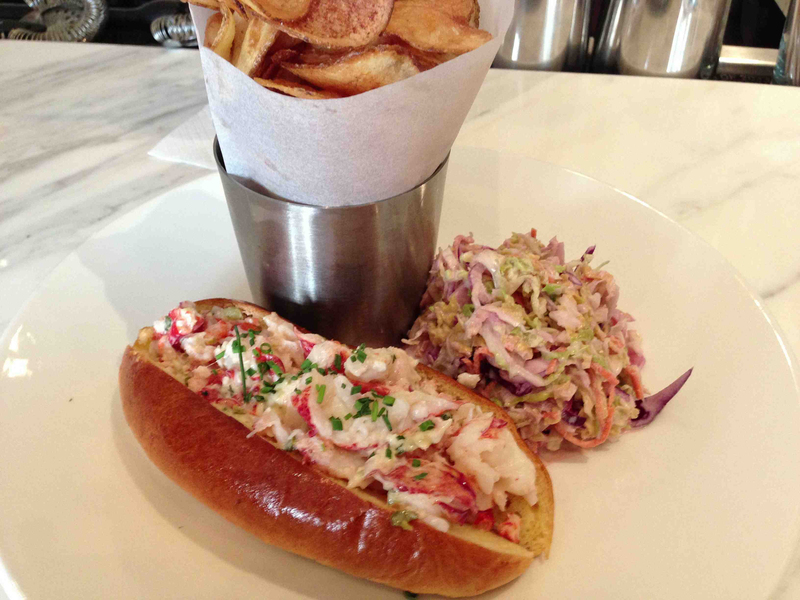 I had planned what I was going to order a day in advance: Sarabeth’s lobster roll with coleslaw and housemade potato chips. I like that they say “housemade” instead of “homemade” because, as you may know, I take issue with restaurants claiming their offerings are “homemade” (if they aren’t made in my or your kitchen, they’re simply not homemade). The brioche roll was buttery and the succulent pieces of lobster were perfectly doused in a mayonnaise dressing that delighted the palate. I was pleased with the sandwich. As for the coleslaw, well, it was subpar, in my opinion. But the potato chips definitely made up for the coleslaw–they were well-done and crispy, and had a solid potato flavoring. My lady dining partner opted for the turkey burger, which was served on a giant bun with guacamole and Sir Kensington ketchup on the side. 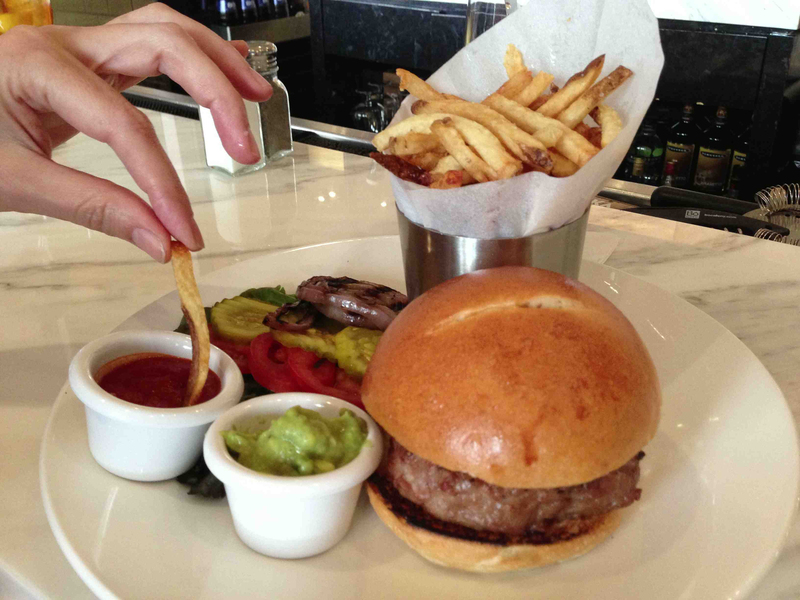 It also came with limp french fries which were tepid and fair, at best. She found the burger to be juicy and enjoyed its flavor. Much better than Grey Bar’s version, she noted. 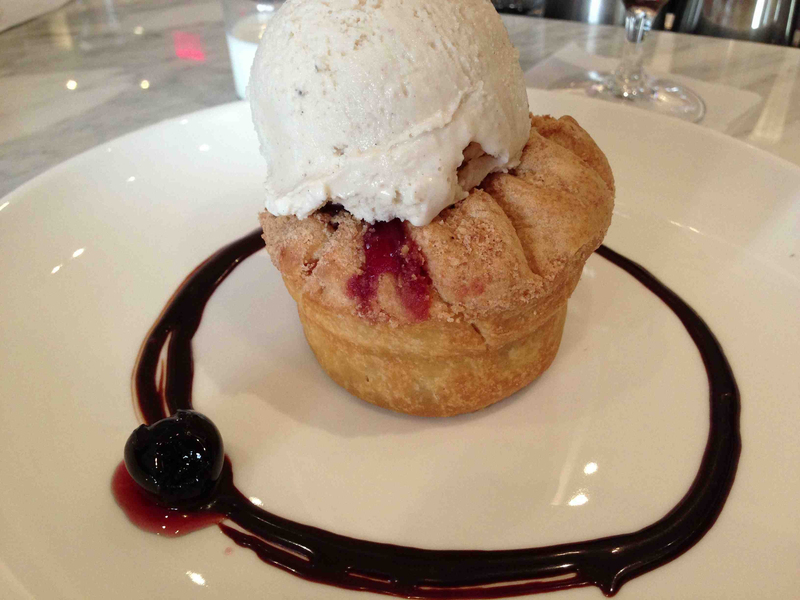 For dessert–because at Sarabeth’s, you have to order dessert–we got the cherry crumb pie which was topped with a delicious vanilla ice cream and neatly placed in the center of a large white plate defined by a circle of chocolate-balsamic sauce. While the ice cream was outstanding, the cherry cake left something to be desired. It was sweet and had a nice crust, but it didn’t wow me. The Park Avenue location is Sarabeth’s latest outpost. I’m happy to see such a restaurant in my work neighborhood, as it offers me a nice place to take a colleague or friend for a special lunch occasion. All in all, Sarabeth’s is worth visiting, but be sure to bring your credit card or lots of cash–the menu is on the pricey side. Take the 6 to 28th Street and walk south one block.